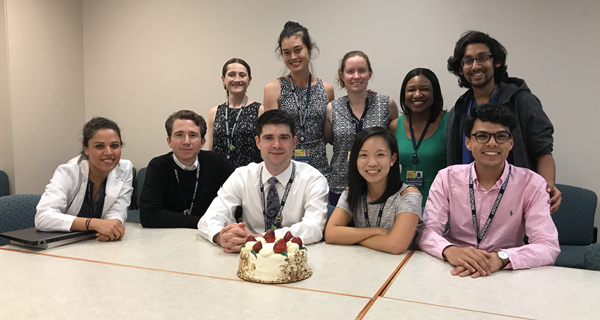 The Pathology Resident Wellness Committee was established by residents, for residents. The Committee's mission is to cater to the unique needs of pathology residents in order to promote overall resident well-being, including physical, emotional, social, and intellectual wellness. The Committee works to enforce the Physician Wellness Guidelines set forth by the ACGME in conjunction with hospital-wide resident and fellow wellness initiatives. The Pathology Resident Wellness Committee is hard at work to improve the well-being of our residents. Some of our accomplishments thus far include getting a fourth week of vacation for our interns, providing healthy snack options, sponsoring our first annual Resident Retreat, and arranging a monthly resident coffee and snack social. We are excited about our progress thus far, and we are looking forward to continuing our resident advocacy. - Unburden your frustrations to another provider. It's like calling your best friend, if your best friend understood all that jargon you use. - Talk to a clinician if you are concerned about yourself, a colleague, a student, or a loved one. Available for your immediate family, too. After business hours, a masters-level clinician is on call 24/7. - UHS offers a variety of outpatient mental health services, including psychiatric assessment, treatment and individual therapy. *For urgent care after hours, call the number above and press "0". You will be connected to the Johns Hopkins Hospital paging operator. Ask for the University Health Services - Mental Health psychiatrist on call. - As a resident, you get a $120 monthly credit for Galley Foods. Orders include balanced main courses, sides, options for families and kids, and dessert. - Located on the JHMI campus. As a resident, you get free gym membership! - Includes kickball, softball, beach & indoor volleyball, soccer, football, basketball, dodgeball, and more!